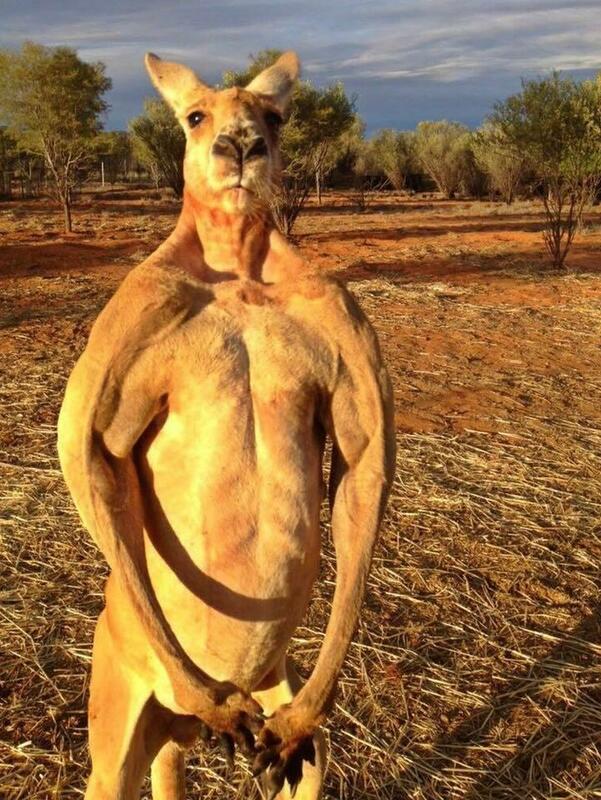 Roger the kangaroo gained fame for his muscular build. He died at 12 years old. Roger, a buff red kangaroo who made his home at a sanctuary in Australia but achieved renown worldwide for his impressive musculature, has died at the age of 12. Roger grew up to be the alpha male of the community. And — as the Internet noted in sometimes uncomfortable awe — what an alpha male he was. The kangaroo stood 6 feet, 7 inches tall and weighed nearly 200 pounds, according to the sanctuary. Every now and again, photos of him would make the rounds online, inspiring the same admiring words. Muscle-bound. Super buff. Massive. Beefcake. "He grew up to be a kangaroo that people from all over the world have grown to love as much as we love him too," Barns, who also goes by the name Brolga, said in a video posted on Facebook on Saturday. "So we reflect on his life today, and for many years to come." Those muscles weren't just for looks. Roger was a ferocious fighter. Barns — the man who founded The Kangaroo Sanctuary after he found Roger as a tiny joey — has the scars to prove it.
" 'He's a big boy, and very aggressive,' says Chris, lifting his shirt to show off some war wounds.
" 'Basically he's just a fighter,' says Chris. 'It's natural for an alpha male. He likes to see the threat go, so will always come out to confront you. If he grabs you, he doesn't let go. You can't get out easily. It's a chokehold. As for a well-placed kick, it can disembowel you.' "
To be clear, Roger is not the only brawny kangaroo in Australia. Red kangaroos are the largest living marsupials in the world, and the males box to establish dominance. Only the alpha male mates with the females in the group, called a mob. Boxing abilities, therefore, are a useful skill for a male red kangaroo, and a physique like Roger's is a possible result. In recent months, the Kangaroo Sanctuary described Roger as "retired," a reference to the fact that he was no longer the alpha male there. His son Monty took over "after a quick kickboxing match with Roger," the Kangaroo Sanctuary said last year. You may not be astonished to learn that Monty, too, has an impressive physique.